How Long Should A Marketing Campaign Last? In a target focused, goal-oriented, objective driven industry, timing is everything! If you don't have timely goals and objectives, does your marketing campaign even matter? We’ll be discussing all those factors, showing you how we run our campaigns, some of the obstacles we've faced and how we’ve changed, and what we think the ideal length for a marketing campaign should be. Firstly, marketing project type affects the length of your campaigns because it determines the style of campaign you’re running. Overall Marketing Plan — usually spans 1-5 years, a top-level document that will tie into the company’s business plan. Inbound Marketing Campaign/Outbound Marketing Campaign — A yearly plan of marketing activity that allows you to be more specific about what you want to achieve. Individual Marketing Strategies — search engine optimisation, PPC; an in-depth plan of whatever campaigns you’re running inline with your inbound campaign. Why Do Goals Determine My Campaign Length? Once you’ve determined the first four requirements, you can move onto timely. Let’s say you want your sales team to close more deals, so you’ve set them a target of increasing closed leads by 5%. It’s specific (the amount you want to increase), measurable (you can use your CRM to keep track of figures), achievable (challenging, but rewarding for you and your team), and realistic (you aren’t doing something someone’s never done before!). Now let’s deal with timely: I want to achieve this goal in four days. Woah there, slow down! Lead conversions could fluctuate quite a lot in that time-frame, how can you work out an accurate average in such a small space of time? Let’s reassess this time-frame. I want to achieve this goal in six months or two business quarters. That’s better. Increasing sales by 5% in six months is SMART. If we refer to the sales goal above, do you think marketing would play a part in this? If you said yes, you’re right. If sales need marketing to create 15% more leads for them to close 5% more leads, this could affect the length of the campaign. If it takes marketing six months to create 15% more leads, the sales goal would need to align with the marketing goal. It gives everyone more time to reach their targets, and means teams are working cohesively. So, when you create your marketing plan, remember how the length of the campaign can affect other teams and adjust it accordingly. There’s no set time-frame for each specific marketing method, no rules or regulations. You should have a discussion with your team and work out what you think the best length is for your campaign. For example, if your business sells mobile phones straight to consumers, you’d have to consider the best way to sell that product. Writing a blog and waiting for it to appear in a search engine isn’t going to get the best results. You could get some quality photographs of your most popular products and run social media or pay-per-click (PPC) campaigns to get faster sales. You could run each product for two weeks and see which performs best. It’s all about trial and error, keep putting the effort in and making slight alterations, you’ll get results! The size of your team could determine the length of your marketing campaigns. If you have a smaller team, or if you have one person doing all your marketing, they can become stretched and may need more time to complete tasks. For example, if you’re starting a PPC campaign and you need to plan it, but your marketer is busy coordinating a last minute event, it could delay the process. So be patient and don’t set expectations too high when you have a small team. Large teams can experience problems like the above as well. More team members mean more projects to manage, so time management needs to be a priority if you want to hit campaign deadlines. This isn’t always possible though; you can never predict what happens in marketing! Experience also plays a role in determining campaign length. If you’ve got a Marketing Manager or a team of marketers with many years of experience, there’s a good chance they’ve already executed numerous marketing campaigns throughout their career. They’d be in a suitable place to manage campaigns and give realistic, timely deadlines to stick to. Contrastingly, a less experienced marketer or team of marketers may not know how to plan a campaign for a start, or how long to run one for. Deliberate whether to give these team members more time for their campaigns and don’t put too much pressure on them to start with. Your resources can also determine how long your campaigns last, and let me tell you, manual takes longer than automated marketing in most cases! Work out when to use manual and automation, when you're dealing with customers it’s important to have that personal touch. But if you’re calculating campaign success, doing maths and working out percentages, it’s always better to have software that can work it out for you. For example, two companies go to a tradeshow and have the same goal, to collect 300 email addresses for an email marketing campaign. One takes 500 sheets of paper to be filled out which they then have to take back and input into their CRM. The other has an Ipad with a 30-second form on it that automatically sends the person to the email list. Who do you think achieved their goal? And who did it the quickest? The last team, of course! It’s not to say tradition doesn’t have a place in marketing, but try to figure out what the best way to do something is to keep your campaigns flowing. Shorter campaigns have their place in marketing, but more so in paid areas of marketing like PPC and paid social media. These ads are shown to a lot of people in a short space of time, for your money! So it’s important to know what’s happening and how successful they are. If you don’t monitor these campaigns, they can spiral out of control, and you can end up losing a lot of money for nothing. So sometimes it’s better to get a marketing agency to design and develop them. You can run email campaigns in a short cycle as well, but email campaigns can’t be used to generate leads because you already have their contact details. You can use emails to nurture prospects and out more information. Generally, shorter campaigns should be used as part of a broader inbound marketing plan. For example, an inbound plan would last for 12 months and would have smaller email, social and PPC campaigns as the supporting blocks. You can run more than one social, email or PPC campaign at once as well, just make sure you and your team can manage it. We used to pack a lot into a month with our inbound campaigns, usually in the form of content like blogs and premium offers. We realised that to have a better campaign overview and to give ourselves and our clients better campaign management we’d spread the workload into different areas of marketing. However, this still meant we were carrying out a lot of work over a short period, so we started to try out 6-week campaigns which gave us a little more time to get tasks done. Medium length campaigns can last anywhere from 6 weeks to 3 months, although you could argue it’s better to measure a campaign by quarter. The reason for that? It allows the marketing cycle to flow with the business cycle, meaning you can measure marketing and business metrics at the same time to get a better idea of how successful you’ve been. Medium length campaigns also allow you to spread work over a longer period, so there’s less rush and more time to execute specific tasks within a campaign. These types of campaign also make for better planning, which means you won't make any hasty decisions and there’s time for everyone to approve ideas. You can run a medium length campaign for any type of marketing, which is why we think it’s the best. You can change small elements to improve performance, but there’s no need for a complete topic overhaul. We like medium length campaigns because it makes it easier for everyone to stay on the same page, and gives clients time to understand what we’re proposing and what we expect to achieve. It also gives everyone some breathing space, we know we have time to focus on what we’ve planned. This makes for more considered decisions and a more relaxed approach to achieving our goals. The main advantage of planning long term marketing campaigns is that you’ll collect plenty of data to analyse! Great marketers love data whether it’s good or bad because it helps us improve. Unfortunately, it may be unrepresentative of the campaign if it’s taken over a short period. For example, you may increase your traffic to 7,500 hits in June, but if your average is 3,500 hits a year, it isn’t a true reflection of your overall traffic. The disadvantage of long-term campaigns is that you’ll often lose momentum and motivation when you slug 6-9 month campaigns out. It can demotivate everyone because you never feel like you’re going to reach a goal. We’ve never conducted a long-term campaign, it’s too much to plan ahead. What if you want to rehaul six months of your plan because you’ve had another idea? You’re undoing a lot of work and it isn't productive. What Can I Do To Ensure My Plan Runs Smoothly? Think of it as a set of tasks to complete on a timeline. You’ve got your overall marketing plan which will span 1-5 years. You’ve got your inbound marketing plan which is yearly. Running for three months at a time within your inbound campaign are your smaller marketing strategies (let’s say you focus on sales techniques, blogging, SEO and PPC), and in those are the smaller strategies you use to build them which (email, blogs). Once you have an idea of how your campaign runs at all levels, it’ll give you more confidence to execute it. That all depends on the campaign, you’ll usually see results in your overall inbound marketing campaign in increments over the years you’ve planned it. It’s the same with your overall inbound campaign. When you start to look at three-month campaigns and the strategies that accompany them, you can see quick wins in all areas. For example, you’re more likely to see quick wins posting a blog series on social media than you are waiting for it to rank in a search engine, but if it does rank, you can get plenty of wins for years to come! You've also got to remember how you measure success, so as you can see from the graph below, our traffic has risen significantly in the past two and a half years. However, if we view lead generation as a more important metric and we haven't achieved what we wanted to, have we seen success from our inbound campaign? Depends how you look at it, I suppose! How Do I Get Started With My Inbound Campaign? Before you get started with your inbound marketing campaign, you need to think about your overall marketing strategy. 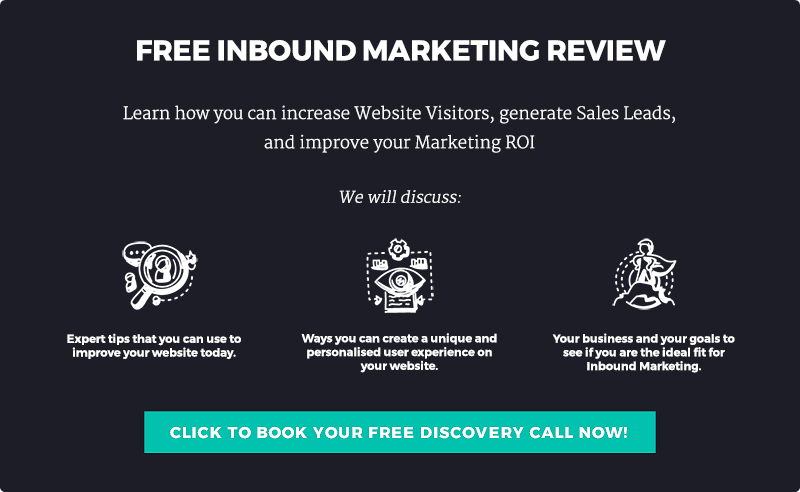 You can find out how to start by filling out the form below for your free inbound marketing review.’.